I'm sorry I didn't post last night. My finger took a beating from an 8 pound dumbbell. It was not pretty. It still isn't, but I've decided to use Photoshop instead of the more common Western medicine approach. Though clinically unproven, the effects are remarkable! I wanted to use my Saran wrap technique again. I used Lila (Savina) and No Room for the Blues (OPI) for the colors. It made a nice periwinkle mix, reminiscent of Secret Agent Lila. I topped that with Wish Upon a Star (Polish Rehab). I got lucky with the stars on a few of my fingers. It's hard to see them in the bottle, and to be honest, I forgot they were in there. It was a nice surprise when they came out on my nails. Pretty cute, and a nice way to spice up a manicure. 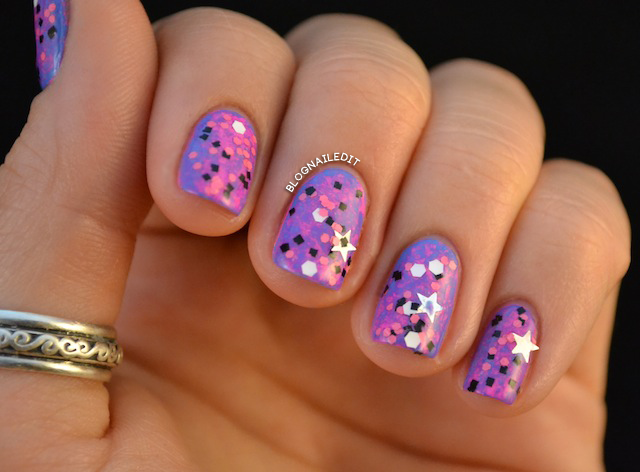 Solid colors and glitter are great, but I need more! Those colors go so well together. I <3 them!! Your saran wrap looks great and I love the glitter you topped it off with! Love this! The saran wrap base is gorgeous on its own but I love the star glitter too! I've never heard of the saran wrap technique, but this is a super pretty mani! So pretty. Easy technique with great results. 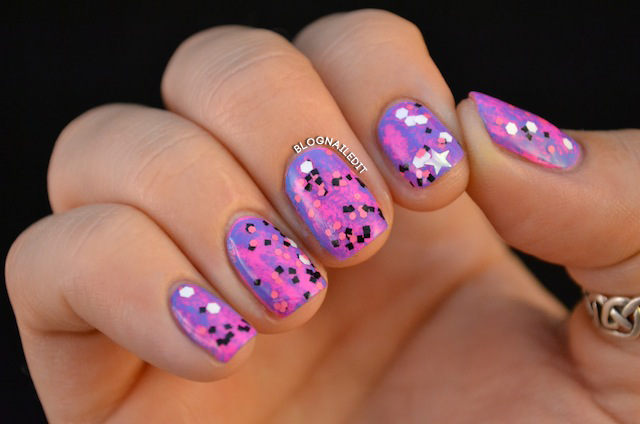 This is one of the most beautiful manis I've ever seen!